Craft Link List is a curated publication collecting interesting links about Craft CMS. Subscribe now and never miss an issue. Craft 3 Falling Into Place: News, Tips, Plugins and More. Welcome to October. This is Dot All month, Oct 22-23, specifically. In case you're looking to join a bunch of Craft CMS people to learn and have some fun, you can still attend. This issue has the usual mix of news, tips and plugins for your favorite CMS. I hope you enjoy it. Thank you to fortrabbit and Freeform Pro by Solspace. Trying to convince yourself (or your employer) that Dot All is where you should be later this month? Give this a read. 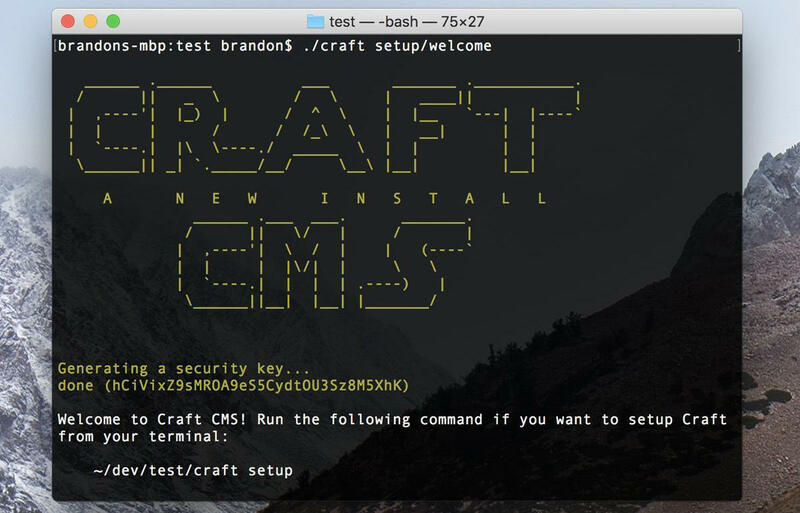 Beta 29 moves Craft 3 closer to final with more fixes and the ASCII art you see above to make your terminal happy every time you install Craft 3. Beta 27 included support for a CRAFT_LICENSE_KEY_PATH PHP constant so you can customize where your license lives. Beta 28 came out almost immediately after 27 and fixed a few loose ends. Also of note in Craft 3 beta 27 is the new securityKey requirement. Your newly created Craft 3 sites should automatically generate this key into your .env file. Why is this happening? "Soon we will start encrypting sensitive DB data with it (like email passwords) that will be rendered useless if you lose/change the security key." Security is good. fortrabbit is affordable, easy-to-use, scalable, and super developer-friendly. Regardless of the size of your project, fortrabbit takes care of the AWS heavy lifting allowing you to focus on development. Sponsor an upcoming issue of Craft Link List in an issue's featured sponsor area. How do you password protect a Craft CMS site in progress? Do you use Valet with Craft? If you're writing a custom driver for Valet (instead of the default Craft driver included with Valet) check out this Gist on Github. How do you add HTML attributes when using the markdown filter? This StackExchange post suggests a few options. What does wget --mirror --convert-links --html-extension --wait=2 -o log https://site.com mean? That link above will explain. As to what this command does, it generates a set of static html files for the whole website that you could put on a web server. I gotta write that down somewhere. What is a safe number of related entries before performance is hindered? This is a post from my own blog. It shows how I extract YouTube IDs from a YouTube URL that my clients paste into their Craft control panel. Plugins that need to extend the Craft CMS Control Panel can use this library and import _mixins.sass into their Sass files, giving them the same mixins and variables used by core Control Panel templates. David Hellmann shows how to make Craft CMS jump through some hoops. Need more from Freeform? Freeform Pro includes all of the same features as Freeform, but includes support for popular API integrations, additional fieldtypes (confirmation, date & time, number, phone, rating, regex, website), flexible exporting options, and powerful widgets! Try Freeform Pro today! Sponsor an upcoming issue of Craft Link List. Superbig is out with another plugin to make your Craft adventure more productive. This plugin lets you attach Craft Commerce invoices as PDF to order emails. GTmetrix gives you insight on how well your entries load and provides actionable recommendations on how to optimize them. Post Craft3 entries on Facebook. Scan and purge unused assets. Cole Henley, the author of this plugin, says to be aware this is only in the "alpha/beta" stage of release and to not use it in production yet. Allows you to eager load elements from auto-injected Entry elements on demand from your templates. Password protect your entire Craft website with a single password. A fast and easy way to lock down access to your website, without worrying about Apache or Nginx configuration. Let your users define their own table columns with this plugin from Supercool. An estimated read time Twig filter plugin for Craft CMS. Simple rich text field based widget for your Craft dashboard. Another Superbig plugin. Quickly move to the next or previous Commerce order in line. Remake of weighted search plugin for Craft 3. It’s not Craft, but it’s interesting. Since this is Part 5 there are other pieces to read too, but the “sizes” parameter is the one that seems the one that requires the most explanation. Or, how to cut about 50% of JS code size for modern browsers. GitHub, in collaboration with Facebook, are pleased to announce the launch of Atom-IDE - a set of optional packages to bring IDE-like functionality to Atom. There was a good discussion in Slack a couple weeks ago about keeping your business afloat. The book The Revenue Growth Habit: The Simple Art of Growing Your Business by 15% in 15 Minutes Per Day by Alex Goldfayn was mentioned as a good resource. Native UI brings macOS’ looks to Atom.